As soon as I heard the theme for this reveal I knew I would be able to carry on with my Omani series. The entrances to building here are often magnificent with wonderful arches and spectacular wooden carved Doors. I took some time to decide but eventually chose to use a photograph I took showing part of a ruined village ( another of my loves architecture) with wonderful arches and perspective a my source inspiration. I used a combination of almost exclusively hand dyed fabric, fabric paints and thread to produce my interpretation of the image. The colours are worked around my favourite split complementary of golden yellow through to orange red with just a hint of cerulean blue for the thorn bush growing wild in the foreground and the detail work on the large stones in the foreground wall. It was constructed by creating freezer paper templates which were then fused onto a background from the back to the foreground. 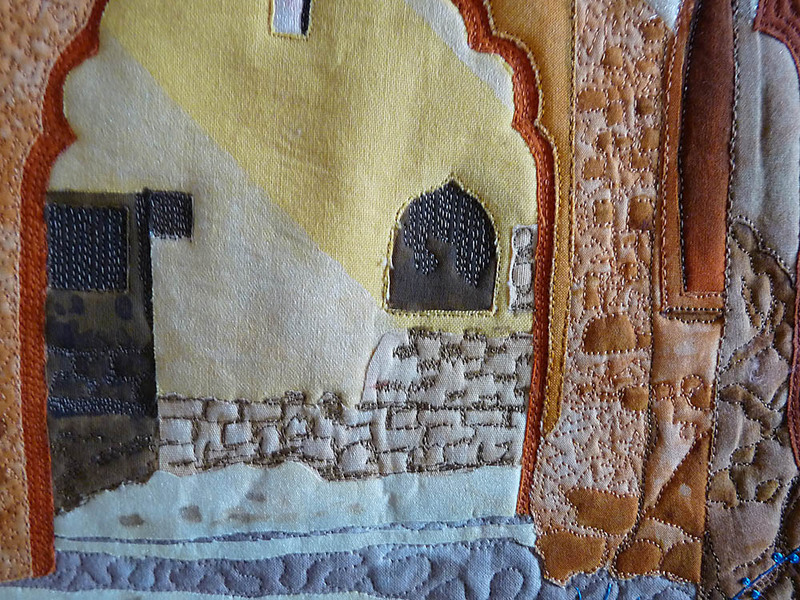 Fabric paints were used for details and to enhance some of the texture in the hand dyes. A neutral organza was used to try and give the impression of the shafts of sunlight, except those in the foreground which are painted. I free motion stitched detail and backgrounds. 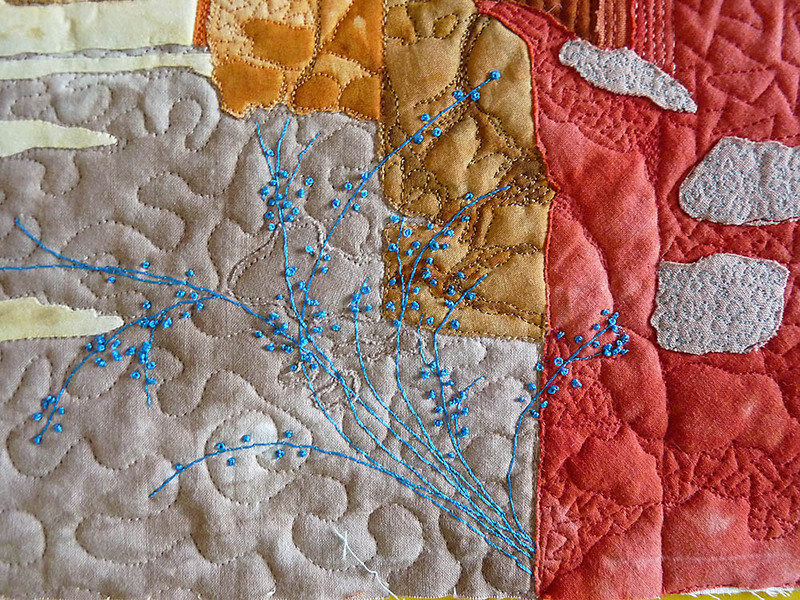 The bush is hand – stitched with thread couched for the stems and French knots for the foliage. 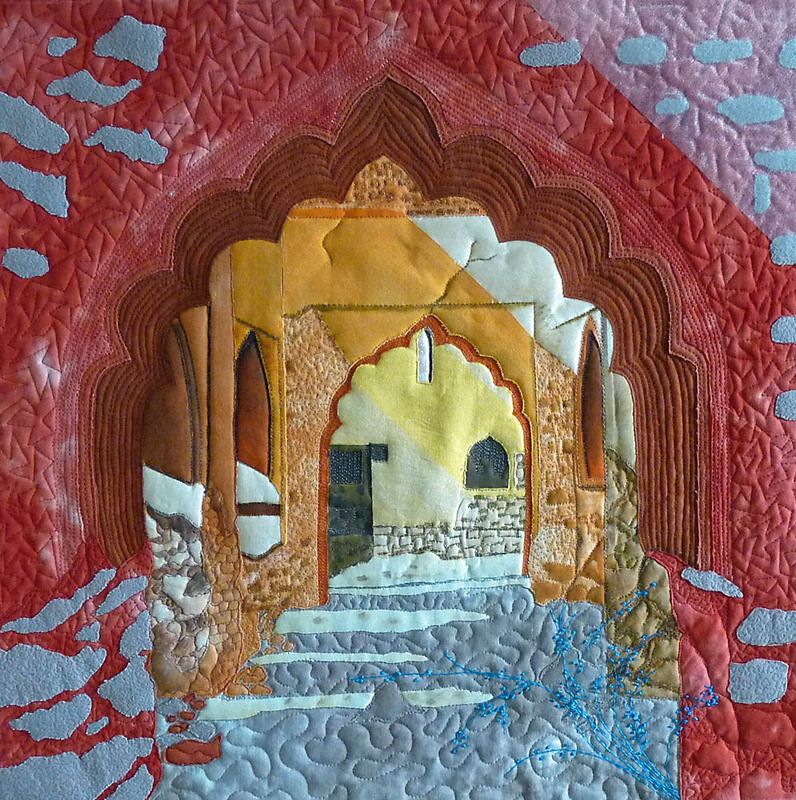 I have really enjoyed doing this quilt and hope it has succeeded in portraying what I was aiming for. I think you’ve really captured it, indeed, Gaye. I particularly like the ruin effect of the walls in the foremost portal, and your perspective is right on target. Just beautiful Gaye, and so realistic. Gaye, this is stunning, great proportion and colours, can feel the difference between the heat and the shade. 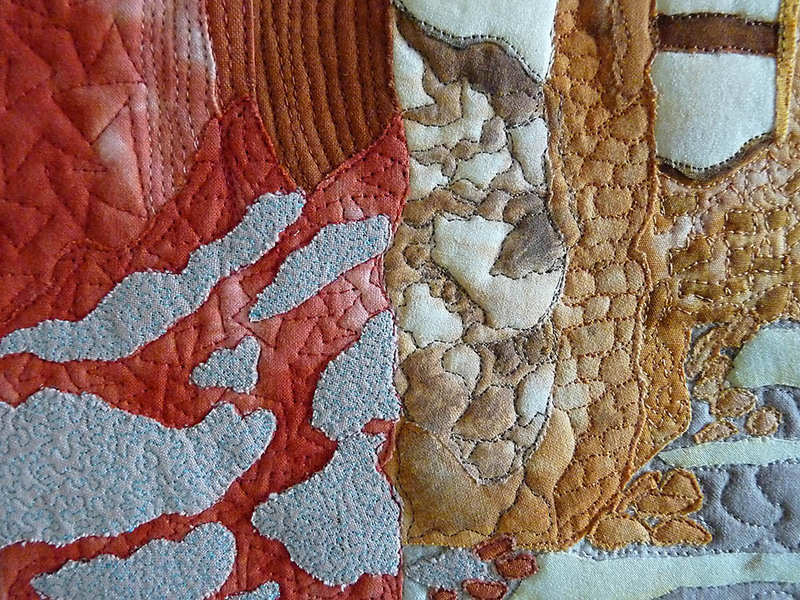 Lovely details and very nice free motion quilting. I have to agree with all the comments above, the detail just captures the old ruin so well. I too love architecture, and take lots of photographs of old buildings, bridges etc. on our travels.